A wonderful, sunny resort set high in the Grandes Rousses mountains of the Southern Alps. 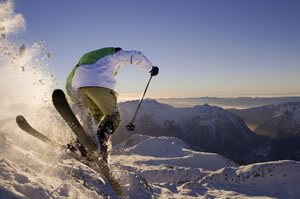 Alpe d'Huez is the 5th largest skiing area in France. The skiing and snowboarding is extensive and varied, with the Alpe d'Huez area plus 4 smaller villages which link into it - Vaujany, Oz, Villard-Reculas and Auris. French Weather Bureau has recorded an average of 300 days’ sunshine a year at the resort. Alpe d'Huez is traditionally one of the stages of the annual Tour de France cycling competition. hiking, walking, mountain biking, swimming, parapenting, indoor and outdoor pools, via ferrata, climbing, horse riding, golf, tennis. good choice of restaurants from typical French, Italian and varied menus. quite lively - look for the club hotel bars eg. The Underground below the Chamois hotel. Many bars with live music, reasonable prices. good indoor pool, open-air heated pools (nb: for men - bermuda style swimming shorts are banned, so take proper trunks/speedos), outdoor skating rink, sports centre, ice driving school.